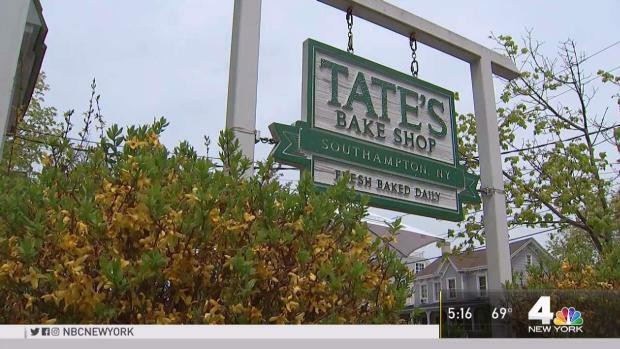 The popular Tate's Bake Shop on Long Island caught fire Friday night when a trailer by the building went up in flames. Some machine work was being done to the building housing the bakery at 62 Pine St. in East Moriches when an 18-wheeler full of supplies somehow caught fire, according East Moriches Fire Department Assistant Chief William Youngs. The blaze spread into the building, though it only went two feet in and didn't go far. Youngs said sprinklers prevented the fire from spreading. Still, the building wall was badly damaged. Officials are looking into a cause of the fire. Southampton institution Tates Bake Shop has just been purchased by a food giant for $500 million. So what does it mean for the bakery's Long Island heritage? Greg Cergol reports. Tate's started as a small shop on Long Island, eventually becoming a staple on the East End and then growing to a national brand. Last summer, the company was sold to Mondolez International, the maker of Oreo and Chips Ahoy.